Humana opens today Monday, July, 11, new secondhand clothing store Madrid. It's in the Princesa, 81 Street. The Foundatio has 19 sustainable fashion shops in the capital city. It is the second Humana store opened this year: in January it opened its doors a shop in Toledo, 42 Street. Customers can buy both the latest trends and unique garments impossible to acquire elsewhere. And all at affordable prices: for example, a family of two adults and two children can completely equipped for less than 100 euros. The clothing comes from the central classification of the Foundation in Leganés. It textiles citizens donate through Humana containers are carefully selected. 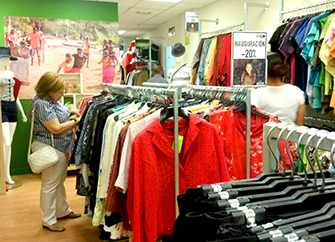 Last year were classified in Leganes nearly 4,000 tons of used textiles. It promotes human clothing second life as a pillar of sustainable fashion. Secondhand clothing supply has increased in Spain in recent years, following a trend arrival of several countries in Northern Europe. Different reasons behind this boom: the affordable prices, the interest in vintage and sustainable fashion, and strengthening responsible consumption values ? ?or social conscience. In 2015, the number of customers of the Humana stores in Spain totaled 1.2 million (14.6% more than the previous year). The Foundation has a network of 39 stores, through which encourages responsible consumption (not to the already made more sustainable garment), helps protect the environment and generates funds for its programs of cooperation and support local.